At the end of October we went to Mauritius for our honeymoon, and it is hands down the most beautiful place I have travelled to. It's one of those places that just looks like a picture. Everywhere is turquoise, and the beaches are gorgeous. 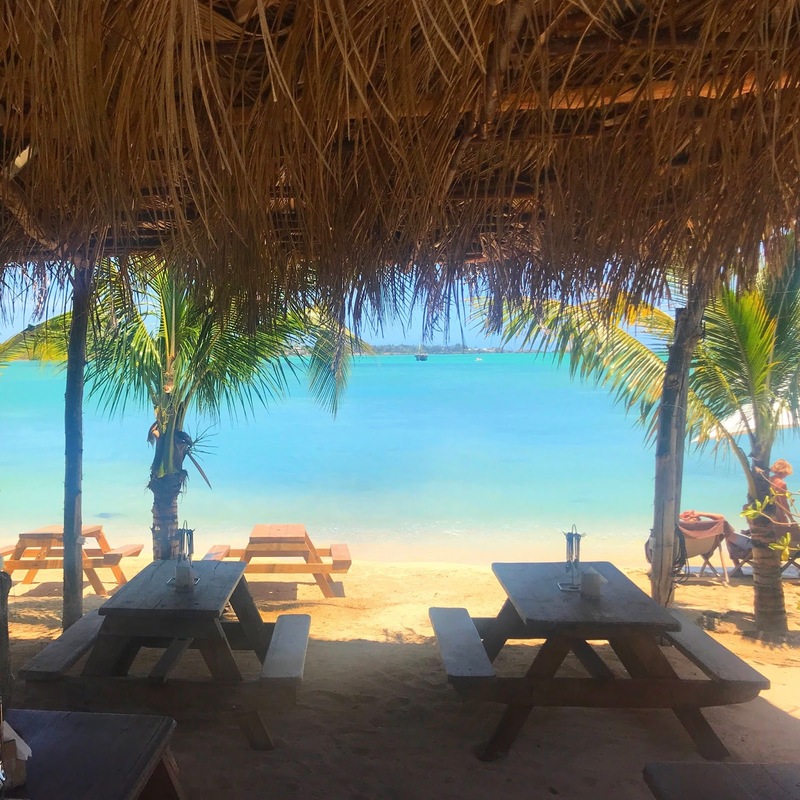 We spent ten nights in Mauritius and opted to stay in a resort, however, the one we chose, Zilwa Attitude, was one that reflected more of a "true" Mauritian feel - which we loved. After reading about the resort (I'm a big tripadvisor researcher, got to read all those reviews) I came across the meaning behind the hotels name. In the Creaole langauge, Zilwa means "islander", and that just made me love the place even more. "Zilwa Attitude is different and unique with its Mauritian concept and invites all guests to discover the legendary genuineness of this little paradise." During the "additional notes' section when booking, the travel agent asked if there was anything we specifically wanted to add. We asked for a high room as we wanted to make the most of the gorgeous view (we have the worst luck when it comes to balconies) but they took note and gave us an amazing sea view room. Our resort had many water activities, the majority were free with all inclusive, and just a couple required a supplement. The free ones included kayaking, pedal boats, laser boats, stand up paddle, water polo, aqua gym, a glass bottom boat and wind surfing. I would hugely recommend doing something like that whilst you're there! The kayaking is a must too, it was so much fun just lazing around the sea and seeing the island from a different perspective. "Come and share our treasures, our smiles, our music, our art de vivre by the sea. Share our experiences, become an islander, a “zilwa”. Zilwa had one main buffet restaurant, three other restaurants and one outdoor bbq experience. The three others were all themed; Indian, Chinese Mauritian, & Traditional Mauritian. These required reservations but were still FREE with all inclusive. This is one of my favourite things about the resort. It felt like you were going out for a meal, yet it cost you absolutely no more. The starter, main, desert and drinks (both alcoholic and non-alcoholic) were all part of your all inclusive board. We made reservations at all of them and each one was amazing in their own way. Mauritians are great cooks I will tell you that. We also did the outdoor bbq, in which you hop on a small boat and are taken to Zilwa's own private island. You spend the afternoon there followed by a BBQ lunch. Again, you get to see the island from a different perspective and it's incredible. Definitely recommend. There were four pools (one was an adults only infinity pool!) and plenty of loungers to go about, we never struggled to find one. Another favourite thing was when you're on the beach, the staff would come round and take your drink order if you wanted one.. and then bring it to you! Finally, I want to talk about the honeymoon meal we had. We were given a voucher for a free candlelit meal on the beach. You're free to redeem this as and when you would like to have it, so we saved it for one of our lasts nights. We had a 3 course meal, by the sea lit by candlelight.. followed by a walk down the jetty (if you can't be romantic on your honeymoon then when can you, right?). It was a perfect evening. Mauritius is gorgeous and I can't wait to go back one day. If you've stayed there before, where did you stay? What would you recommend? I'm having one of those evenings where you find yourself thinking about everything and anything. So, I've decided to write a post to take my mind in a different direction. Reflection This year has been one of the best years of my life. Probably the best. Firstly, after a lot of saving, in the summer, Peter & I finally bought and got the keys to our own house. Sometimes, that itself hasn't sunk in. I'll be sat watching TV during the evening and just think, we bought this house, we actually did it. You think you're never going to get there, that your deposit won't ever build up. Or that you won't find the right place, because you keep viewing houses and they just don't have that feeling. But eventually, the deposit is ready and you find the perfect place. 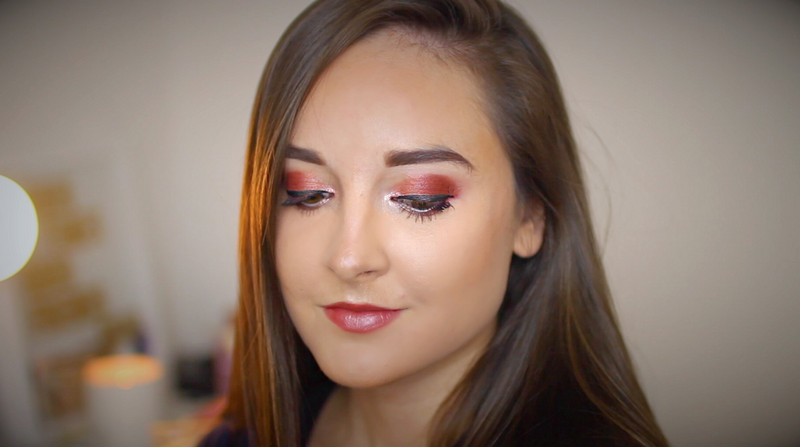 Today I have for you a step-by-step red berry makeup look... and I've used all drugstore products, so you don't have to spend a fortune! All products I have used will be listed at the end of the post, so you can have a little nosey through them too. To prime my face, I like to use a bit of my Soap & Glory moisturiser. Then, I used the Revlon Colorstay Foundation for oily/combination skin in the shade soft beige. After blending this out using a beauty blender, I took my Collection concealer and popped this on my chin and around my nose (in the shade 02), and also under my eyes (in the shade 01). To set this, I used the Rimmel Stay Matte Powder in the shade Transparent. 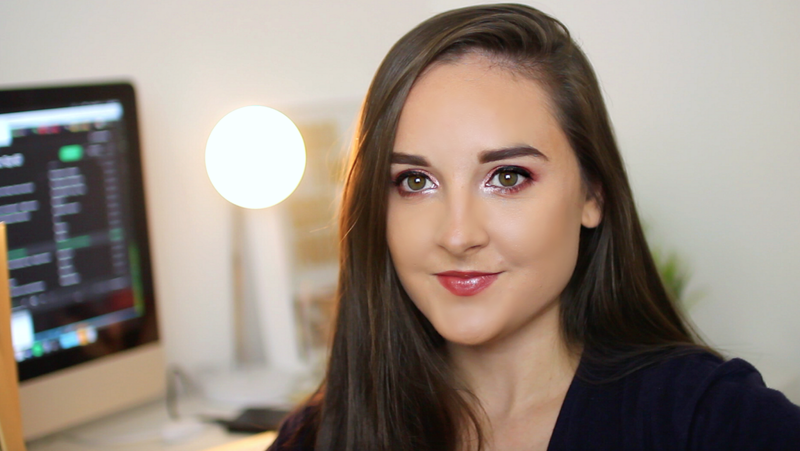 The Soph X Makeup Revolution palette has the most gorgeous shades of red, all of which I used for this look. After priming my eyes, I used the shade "Fairy Lights" just to set the primer and create a base. Next, I used the shade "Pumpkin" and very lightly, I put this over the top of my eyelid, but whilst staying away from the inner corners. Then, using the shade "Danger", I began adding colour to the outer and middle of my eyelid, slowly working my way in to the crease and blending this out with my Real Techniques crease brush. After this, I took the shade "Festive Flame", a gorgeous shimmer shade, and put this on the outer corners of my eyes and working it in to my crease. After blending that out a fair bit, I took the shade "Pink Champagne" and worked this in to the inner corners of my eyes. Because this is a shimmer shade, it adds a nice touch of sparkle and brightens up your eyes. Next, using a small brush, I took a small amount of "Copper Coin" and placed this along the bottom of my eyelash (along the line where you'd put liquid eyeliner), which added an extra bit of shimmer across the bottom of the entire lid. Finally, I took a little bit of "Danger" starting from the outer corners of my eyes and working my way just under the waterline and stopping at the centre of my eye. Joining this, I took "Pink Champagne" and popped this starting at the inner corners and working my way to meet the deeper red colour. To finish off the eyes, I used my Soap & Glory Supercat Eyeliner along with the Maybelline Lash Sensational Mascara. There's just something about this time of year. As soon as we enter September, it seems the countdown to December begins. Everything is so much more magical in December. The world lights up. We bring tree's in to our living rooms, decorate them in swirls of lights and masses of baubles. We eat mince pies and have baileys in our hot chocolates. Your favourite bobble hat makes its yearly appearance, yet the matching gloves you bought seem to have been misplaced. The noise surrounding you is like a constant loop of All I Want For Christmas Is You, and the rest of the festive favourite tracks are dug out. Around November time, I'm always so keen to get the Christmas music going. There's just something so uplifting and joyous about it. If you're extra lucky, snow will fall. And if you're somehow even luckier than that, it will stick, and that plain old road you live on becomes something so white and magical. Snowmen are made, some perfectly formed, and some a little wonky. Fire's are lit, and Christmas films are watched. Is there anything better than Christmas films? The Grinch. The Holiday. Love Actually. The Polar Express. Elf. Christmas With The Kranks.. just some of the many wonderful films. Families and friends come together. Maybe from across the road, across the country, or across the world. 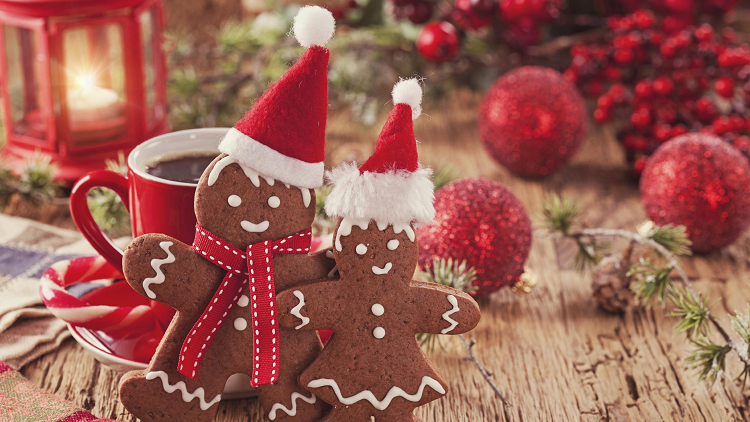 It's a time to share with your favourite people. To show them just how much you value them, showering them in love and laughter. Wether that's watching your partner open their gifts from you. Seeing grandparents dance in their seat to the music. Your Dad rocking the famous Christmas apron as he preps the Turkey. Whoever it is you're spending Christmas with.. make every year the best one yet. [Image: Sian Evans] There are so many good Christmas films out there so I thought I'd share some of my favourites with you... the ones I consider to be under-rated and deserve some more loving'! 4. Four Christmases This one has everything. The romance, the drama and the comedy factor. I'd say this one is big on the comedy front. A young couple come from two sets of divorced parents, and on Christmas, they have four different trips to make. It's full of family drama on Christmas Day! 5. Surviving Christmas This is another romance filled with comedy. It features Ben Affleck playing the lead, and his character pays a family to spend Christmas with him. This is the same "family" he introduces to his girlfriend. (What could go wrong?) Definitely a fun, light-hearted romcom. The Soph X Makeup Revolution Eyeshadow Palette has become my most used palette at the moment. I use it every single day and for that reason, I decided to purchase Soph's highlighter palette. I knew it was going to be amazing, I had no doubts about that, and I want to tell you just how right I was. 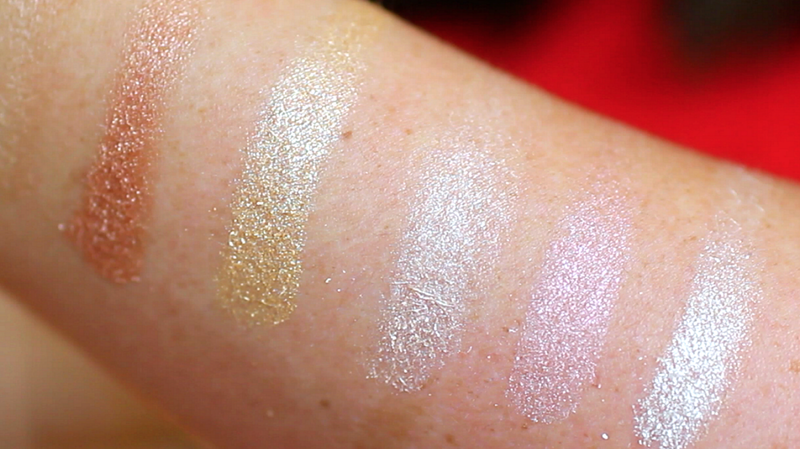 The palette features 8 gorgeous highlighters; 4 of which are pressed and 4 of which are baked. One thing I noticed as soon as I started to swatch them, was just how soft they are. I'm not sure if that's a random thing to notice or not, but I thought it was a valid point to include because so many I've tried in the past feel "hard".. almost as though the highlighter doesn't want to budge from the pan. (Do you feel me?) However these transfer so effortlessly, I barely used any weight on the brush when applying the highlight to my cheek. 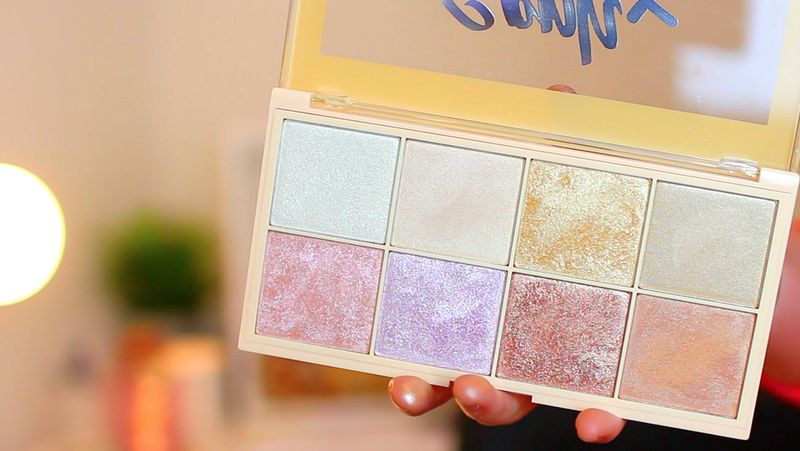 If you're after a new highlight, or you're not sure what type to go for, then get this palette. Amongst the 6 shades, there will be a highlighter in there for you. I've purchased so many in the past that just don't suit me, don't look natural or just generally don't "do it for me". However, these are just stunning and catch the light so nicely. One that particularly stood out to me was the gold shade. It's a beauty and a single swatch of this showed up so well. 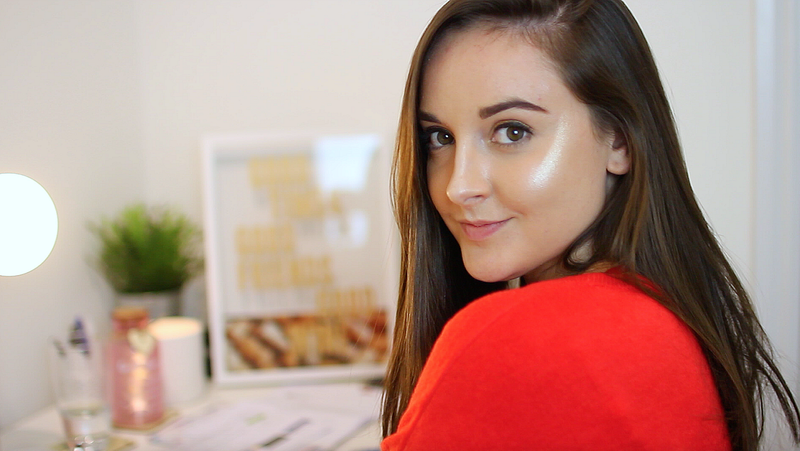 It's super warm, but packed with so much sparkle.. especially perfect for a Christmas makeup look. The silver highlight in the top left also looks SUPER cute as a nose highlight. At just £8 this palette is a gem. You won't be disappointed (and whilst you're at it, give the eyeshadow palette a whirl too!) If you want to see more, I'll be updating this post in the next few days and adding a link to a YouTube video I've filmed where I test and swatch the palette. If you're interesting in purchasing the palette you can get it from Superdrug & Tam Beauty. 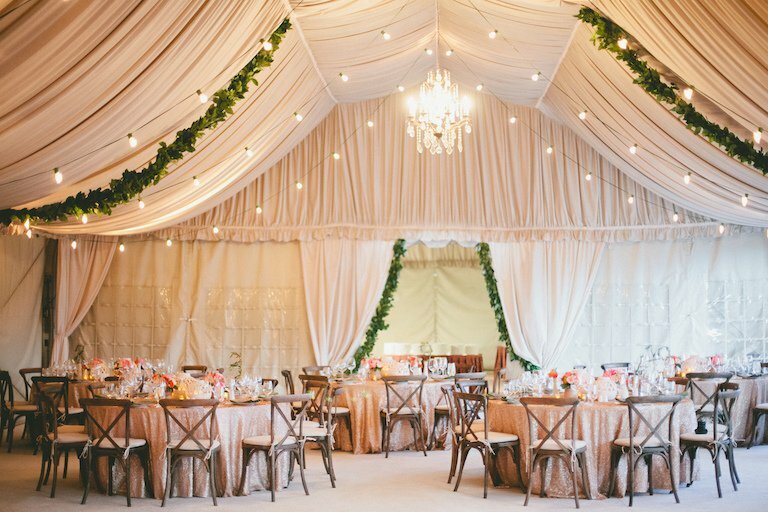 You might already know exactly which venue you want for your wedding, or your dream venue is out there and you've yet to find it. I thought I'd do a post on my experience of choosing our wedding venue and how to find your perfect place. [Image Credit: The Knot] 1. Choose Your Location Where do you want to get married? You might want to stay local, or there might be a place that is special to you and your partner where you would like to get married. A certain town might have caught your eye, or maybe you want to go abroad. Your location will have a huge impact on everything else you need to plan, such as photographers in the area, stylists that can travel. There are many factors to consider, so whatever your preference is, once you are set on your location, the research can be begin. 2. Decide On Your Venue Type What type of venue do you want? Are you after a church hall, a country house, one of your favourite hotels? Whilst there are certain types of venues that fall within 'wedding' category, you really aren't limited as to what you pick. Most venues will be happy to host your reception, so even if they don't advertise specifically, ask! 3. Make A Shortlist Once you've decided on the location and the type of venue you want, you a ready to begin using all your free time on researching the different venues. We decided to stay within our local area, and because of this, there were a few venues I was already aware of and I already knew I wanted to see. There are SO many websites that list hundreds of venues across the UK. Google is your best friend. Make sure you factor your price range when it comes to researching your venues, so you know which venues to rule out and which ones to keep. My shortlist consisted of 3 venues. 4. Make Appointments Now that your shortlist is complete, start making appointments to view the venues. Pictures online aren't always true to life, so it's best to make sure you see your potential venue in the flesh. For example, the second venue we saw, whilst I'd always loved it in the past, once I was viewing it for wedding purposes and the wedding dedicated rooms, there was something that just wasn't working for me. I also found one staff member slightly, unusual, and I wasn't sure how I felt having my wedding in their hands because they came across very disorganised. 5. You Will Know Once we went to view the third venue, as soon as we were walking up the drive, I was like "this is it." It was everything I had imagined. It was perfect, we both loved the venue and knew that was to be the one. If it doesn't feel right, it probably isn't right. So keep viewing until you get that feeling, you will know. 6. You've Got Your Venue! So you've found the perfect venue, check with them that your chosen date is free.. and get it booked. Yay! You've got your venue. I'm going to admit, I am the absolute most laziest person when it comes to cleaning my makeup brushes. I am SO bad and it's something I really should do more often. I find it a chore, and put it off for as long as I can. 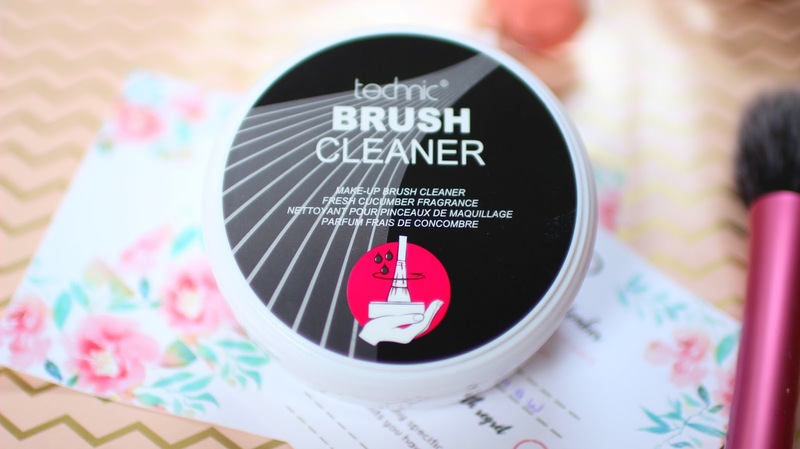 The lovely people at Technic Cosmetics sent me their new brush cleaner to test out, and as I'm typing this, I just finished trying it out. So, lets talk about the product.. 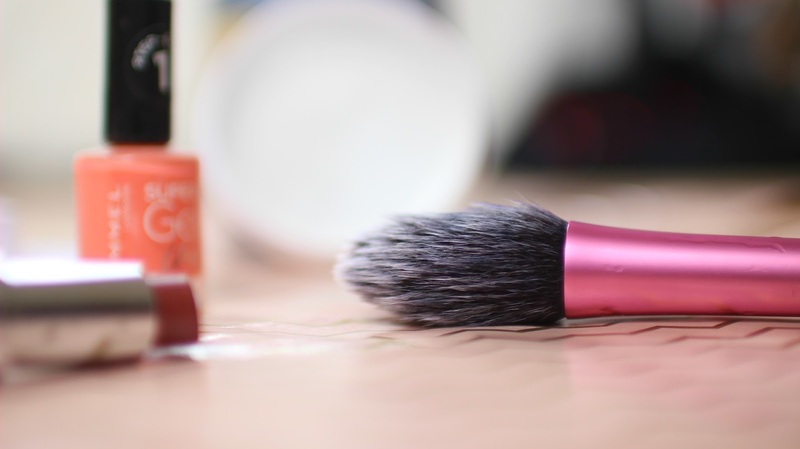 Grab your brush, dampen it with a little water, and simply swirl/brush it around the pot. It's that simple. Being honest, as this is a "hard" product, I wasn't sure how it was going to go and how effective it would be. 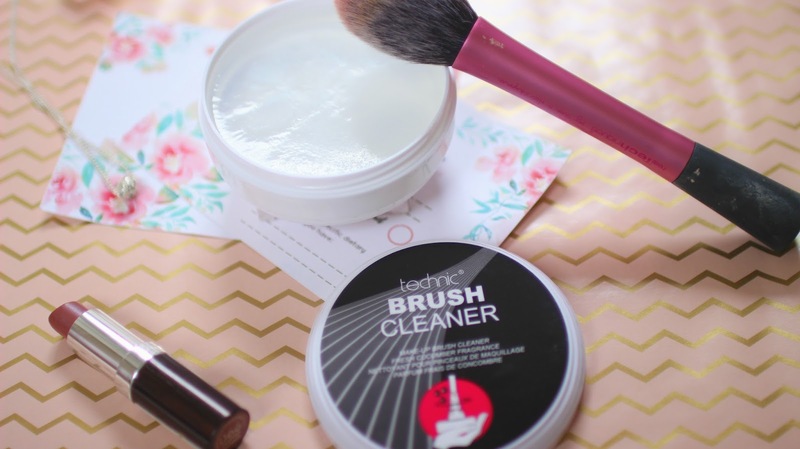 But a few swirls in the product and it foams up a little and dissolves the makeup from your brush. After this, I simply popped my brush back under the tap and that was it. No mess, no time, and my brushes are clean. This makes me very happy. The verdict? I am so impressed. Honestly. If I didn't explain enough the first time round, I cannot stress just how much of a bore I find brush cleaning. I just cleaned my Real Technics blush brush in approximately 20 seconds, and this thrills me. So if you're equally as lazy as me when it comes to brush cleaning, or you just went a change, go have a look at this. In this set of images, the second image shows the brush before I had cleaned it. The third image was taken after I had cleaned it, and as you can see, it's blush free! Yay. Where can I buy it? This brush cleaner is available on Amazon, Pretty Little Thing & Just My Look As always, all opinions are my own and I would never take the time to write a post on something I did not enjoy.. 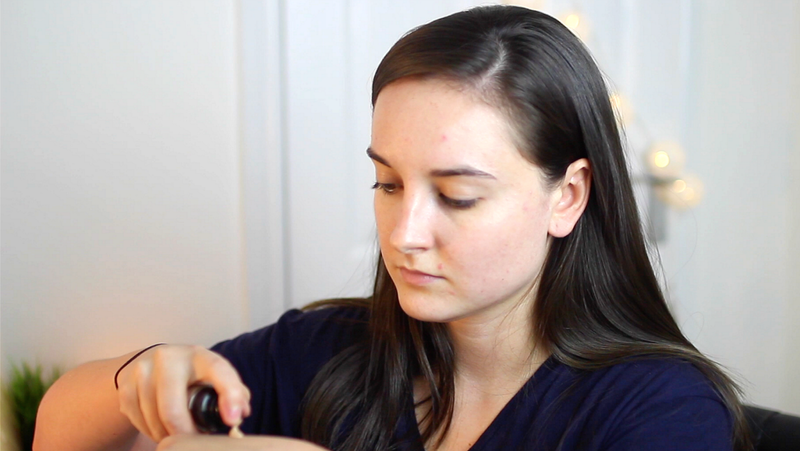 I am just genuinely thrilled to share this little gem with you! Now, I'm off to go and give my brushes a long overdue clean. I recently picked up the Yankee Candle in the scent Sea Air. I got it at an absolute bargain at half the price, and it's a new scent. I'm not entirely sure why, I mean, I'm not complaining, but my local garden centre was selling two of the new candles at £11.99. They were down from £21.99 and if I'm honest, I rarely buy the large ones as they are so expensive, so I jumped at the chance to buy this. Funnily enough, I very almost purchased one of their christmas candles that was going for £6. I'm not even sure if I 100% liked the scent, but it was a large Yankee candle for £6 purely because it was Christmas stock. I wasn't going to refuse that. That was until I spotted the new range, and then the Christmas candle didn't stand a chance. This smells so fresh. It's kind of like, the clean cotton candle, mixed with.. dove soap and fresh air. Yep that's the comparison we are going with. There was another new one that I didn't purchase, but now I really want to go back and get it. I mean, I intend to fill our new house with great smelling candles, so I may as well.. right? I've already bought 3 large candles for our house. I also have three very pretty lanterns which also need candles to go in them, so that gives me a nice excuse to buy more. Go see if you can find it. I'm not sure if you can get it in the tea light versions yet, but I assume you can! Check your garden centres first, you might find a bargain. If all fails, buy a Christmas candle. I'm an avid eyeliner fan. Every time I ran out of eyeliners, I would try a new one. For a while I would use the Seventeen Super Black liquid liner, and did re-purchase that many times. But for the most part, I would always try something new. Because of this, a couple of months ago I tweeted for liquid eyeliner recommendations, and one of them suggested the Soap & Glory Supercat. This very quickly became one of my favourite liners to use. I never really used the pen/felt style ones before, not because I hated them.. I just never really gave them a chance. First impressions, I thought the nib was too thick. I thought it was going to be hard to apply. I was wrong. This applies SO easily. One thing I love about this style of eyeliner is that you don't have to wait for it to dry. At least not for very long. (If you're using a setting spray I suggest you still wait a minute or so, but that's hardly anything compared to a liquid or gel liner.) My fiancé jokes that I may as well buy a sharpie when I use eyeliner like that. (I mean it is basically almost technically a felt tip, but, you know..) So from a male prospective, I totally see where he's coming from.. haha. When I use a setting spray, this does last all day. However, if I don't, it does tend to rub a very small amount. Like, a tiny amount.. and this is only at the end of the day. Plus I think this is largely down to the fact I have combination skin, and have an oily t-zone. Overall, I would give this 8/10. I'd give the extra point if the staying power was that little bit stronger, and possibly if the colour transferred a tiiiiny bit darker. But in general, it's a pretty FAB liner and I will continue to purchase it because it applies like a dream. What's your favourite eyeliner? I'm always looking for more recommendations.